We met a shepherd on the way who had about 200 sheep. He told us that, earlier they reared native sheep for manure, which had great demand from farmers and also for wool. Blanket weavers from Challakere used to come to trade the wool, but now blanket weaving has reduced and they no longer come here. 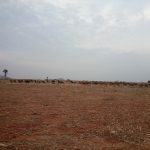 Now, their objective of sheep rearing is only for meat and they have switched from rearing the black variety (kari kuri) to red variety (kenguri) of sheep. In Challakere region, 10,000 acres of grazing land was illegally gifted to research institutions like IISc, DRDO, ISRO, BARC and also to a private company for solar park. These grazing lands were the lifeline for shepherds and weavers, whose livelihoods depended on sheep rearing. With their access cut off, most of the these hand-making people, had to abandon their occupation. Seems like the effect here is far-reaching, affecting even shepherds nearly 100 km away. 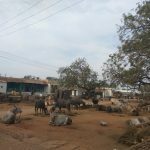 Varadapura, a small village displaced nearly 50 years ago, by the Tungabhadra dam had a striking feature – each household had plenty of native cattle and buffaloes. One cowherd we met had 50 cattle. He said they are a family of 26 and the milk they produce is just enough for their consumption and there is usually nothing left to sell. Another family, however, sells curd and butter. They sell one litre of curd for only Rs. 10, hardly a remuneration for all the hard work that goes into cattle rearing! 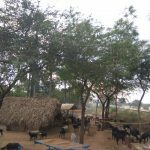 Another incident worth mentioning is that the highway that runs through the village used to be lined with old neem trees on either sides. When these trees were marked for cutting for road-widening, the villagers put up a strong protest. One man even told us that many people wept when the trees were cut. The sentiment stuck a chord with some of us Bangaloreans who have protested against tree cutting in city. In the same village, Hanumanthappa from the Barber community (Savita Samaja) heard about our padayatra and came to meet us. He was speaking how it is important to end caste discrimination in the villages and about how even today, those who are in this profession are not given houses on rent. He also said their shops, which are set up in small boxes by the streetside, are not owned by them but are rented out by the Gram Panchayat and therefore they easily get evicted when projects such as road-widening are taken up. Organising themselves has given them the strength to protest such atrocities and claim their rights. This reminded us of what Mogalli Ganesh said during the Hospet convention, that it is the caste system which started the destruction of unity among the hand-making people. By early evening, we started our walk towards Hampapattana. This stretch was another fascinating landscape along several fields of drumstick. 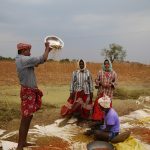 We came across a few people threshing Toor daal (Lentils), usually a three-day process. 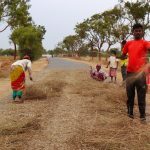 For the first step, farmers have come up with an ingenious method where they spread the harvest on the road. The passing vehicles help in separating toor dal from the chaff and rest of the dried plant. In step two, this is further cleaned by wind winnow method, and in step three, the daal is packed into gunny bags for storage. Another farmer who was walking from her farm to house in Hamapattana, nearly 3km away, joined us and told us about the various crops grown here. With red soil and ground-water for irrigation, their choice of crops is limited unlike the farmers we saw up north. Wind winnowing is an agricultural method developed by ancient cultures for separating grain from chaff. Threshing, the loosening of grain or seeds from the husks and straw, is the step in the chaff-removal process that comes before winnowing. 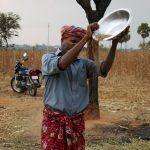 Toor Dal processing, on site. 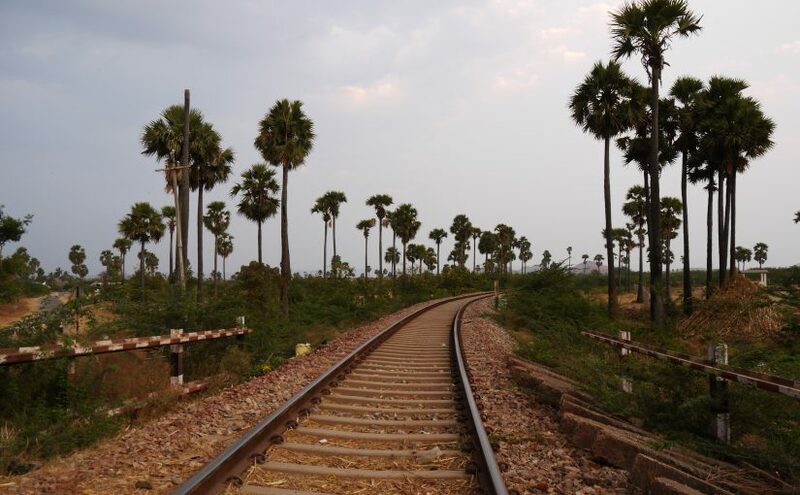 As we approached Hampapattana, we were surprised to see an abundance of toddy palm trees! At the entrance of the village were three different graveyards meant for different communities. Amusing how even death doesn’t teach us lessons in non-discrimination. Finally we reached the primary school at Hampapattana at dusk, our camp site for the night. There is a festive mood in the villages here, today is the big theru (car-festival) at Kottur, our final destination of the Padayatra. Thousands of people have converged there already, from as far as Shimoga and they too, like us, have gone there on foot. As if in celebration, the skies too have opened up giving us some respite from the slowly soaring temperature.